Growing up near Red Shirt Table, a community on the outskirts of the Badlands about sixty miles north of Pine Ridge, Lorri Ann Two Bulls was surrounded by the vast and breathtaking landscape that has been the ancestral home of the Two Bulls family for many generations. From the Red Shirt Table outlook—one of the most photographed places in the region—she could take in the full expanse of rugged buttes and spires that create a terrain unlike any other. Deeply inspired by the beauty of the land itself, Lorri Ann began creating her own art long before she ever considered herself a working artist. 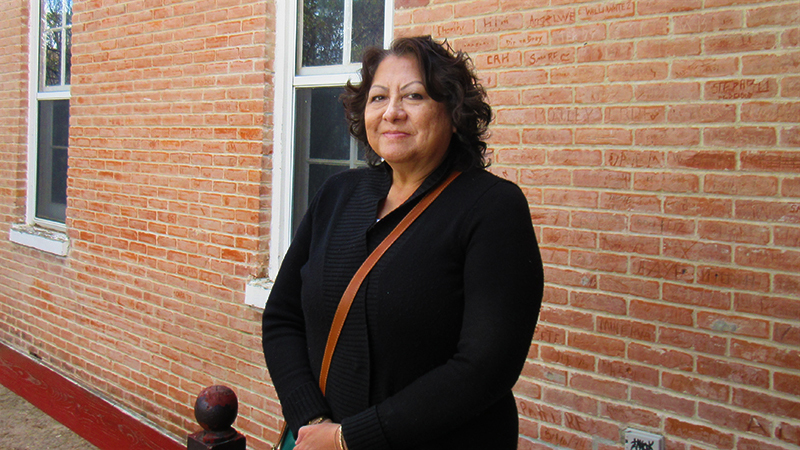 For Lorri Ann, growing up on the reservation meant that art was always an intrinsic part of daily life. Exploring the Badlands as a child, she would immerse herself in creating something new with the objects she found her. But in 1978, when she was just 18 years old, she found her way into the formal art world and entered a portrait series called The Beatles in the Red Cloud Indian Art Show at The Heritage Center. Decades later, Lorri Ann continues to paint and to enter the Art Show to share her work. She says painting with acrylics and watercolor will always be her favorite medium. 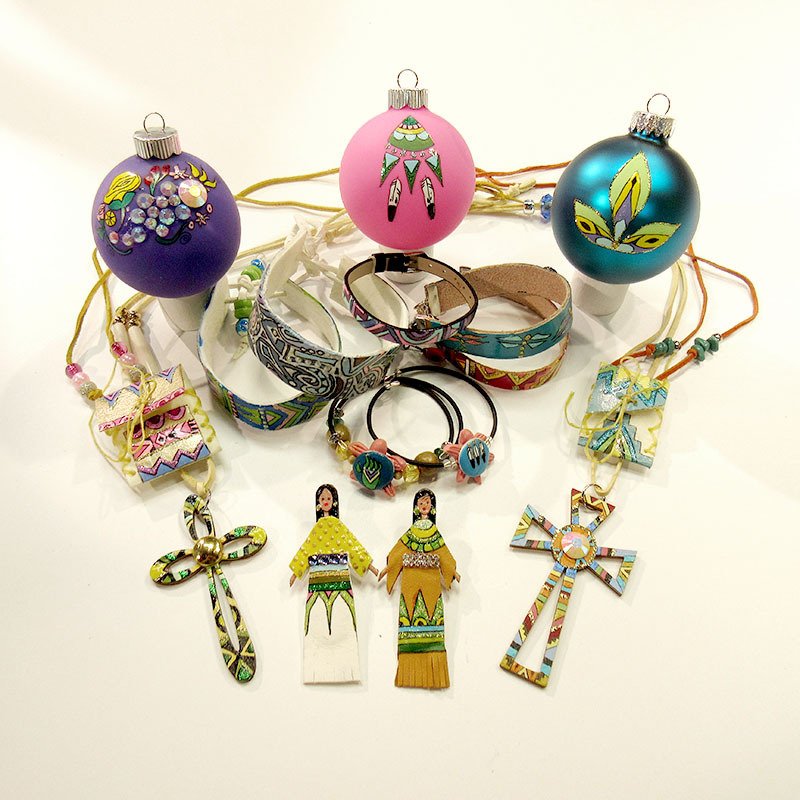 But today she also uses her artistic skills to create jewelry and other unique pieces that are sold in The Heritage Center’s gift shop. Lorri Ann strives to use natural products—like leather, rawhide, wood and clay—that come from the land and environment around her. And visitors often admire the intricate painting that adorns Lorri Ann’s work, from her hand crafted clay turtles, to her vibrant painted Christmas ornaments, to her eye catching painted bracelets. Some of Lorri Ann’s most recognizable pieces in the gift shop are her Owicakapte—meaning “I survived”—doll pins. After being diagnosed with Non-Hodgkin’s Lymphoma in 2002, Lorri Ann began making the dolls using brain-tanned elk buckskin that she delicately paints by hand. According to Lorri Ann, the dolls are for anyone facing or surviving a significant challenge in their life, and they are a favorite of visitors to The Heritage Center. Lorri Ann’s work speaks to people from all walks of life. And although she still creates for herself, she loves it when others find beauty in her work. Photos © 2016 Red Cloud Indian School, Inc.